Pat Metheny's Unity Band is his latest gesture to a mainstream jazz audience that might otherwise give short shrift to his work with The Pat Metheny Group or such idiosyncratic projects as The Orchestrion Project (the main instrument of which turns up here on "Signals (Orchestrion Sketch)"). The Missouri-born guitarist and composer has not worked with a sax player since his 80/81 project featuring the late Michael Brecker. But Chris Potter‚ who has played with bassist nonpareil Dave Holland as well as leading his own groups‚ displays utter panache as he assumes the role of featured melody instrument and soloist. The sound of his horn freshens an array of otherwise familiar elements from the leader's storied‚ Grammy-award winning past‚ helping make Unity Band a primer for anyone uninitiated to his multiple virtues. In line with the layout of photos inside the triple-fold cd cover‚ where drummer Antonio Sanchez and bassist Ben Williams' photos are featured so prominently‚ Metheny must feel the rhythm section is indispensable to the mechanics of this group. Certainly as the quartet kicks into gear on "Roofdogs‚" with Metheny's synthesizer guitar slicing its way forward‚ the rolling flourishes from Sanchez‚ punctuated by Williams‚ make the music move. That track is over before saxophonist Potter has much opportunity to assert himself‚ but his background contributions on "Interval Waltz" hint at what the band might do in a more wide-open improvisational setting. And Potter is in the thick of things right at the outset of "Come and See‚" his atmospheric lines floating over acoustic textures (more of which appears on "This Belongs to You"). The glowing trademark tones of an electric instrument otherwise dominate this cut while‚ again‚ Sanchez and Williams percolate vigorously at the bottom. Just as Pat Metheny is careful to have studio work to support as he tours with this ensemble‚ so are the arrangements here conceived to highlight his facility with his instrument as well as his versatility as a composer. And while he may not be stretching himself much during the course of this album‚ he's nevertheless purposely reasserting his various gifts‚ not the least of which is his skill as a recording artist; his craftsmanlike approach in the role of producer imbues these nine tracks with impeccable sound as well as an undeniable logic. Yet even apart from the singsong quality of "Leaving Town" and the decided air of finality within the album's wryly-titled conclusion‚ "Breakdealer‚" there's a deliberately accessible quality to this album. Whether the PMUB concert tour makes a live release inevitable or not‚ this CD may ultimately comprise mere sketches the foursome will fill in with a variety of colors when they play in front of audiences. 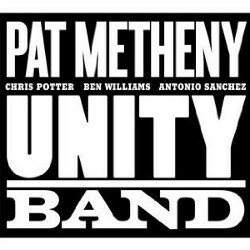 Thus‚ it will function fine on its own terms‚ as both as a teaser for a show as well as a reminder of the consummate collective skill of The Pat Metheny Unity Band.